New Immigrants Settle in Gaza Periphery While Rockets Fall - Breaking Israel News | Latest News. Biblical Perspective. 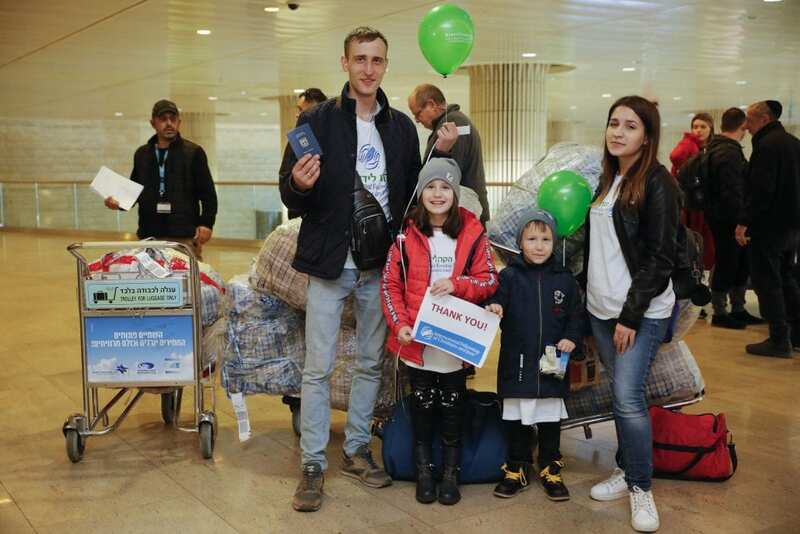 Around 250 new immigrants (olim) from Ukraine landed in Israel on Monday on a flight organized by International Fellowship of Christians and Jews (IFCJ/Keren L’Yedidut). The flight was the sixth Aliyah flight of The Fellowship since the beginning of the year. Fifteen of the olim are moving to Israel’s Negev region, and five are moving to the Gaza Periphery, a region that has dealt with renewed rocket attacks from the Gaza Strip. Even central Israel has not been spared from such terror strikes. Earlier this week, a house in Mishmeret was completely destroyed by a rocket from Gaza that injured seven people including one infant and a toddler. New immigrants, Vladimir Levin and his wife, are following in the path of their son and settling in Kibbutz Tze’elim, located in the Eshkol Regional Council, which borders the Gaza Strip. Vladimir said that just like his son is not deterred from living in Tze’elim, he and his wife will move the kibbutz and refuse to be discouraged by the threat of terrorism. Yelena Tackshenko and her family moved to Kibbutz Ein HaShlosha, also located in the Eshkol Regional Council but much closer to the Gaza Strip. The kibbutz is located near enough to the Gaza Strip that its residents have just 15 seconds to run for cover and shelter after hearing a Code Red alarm for an incoming rocket. Ein HaShlosha absorbed the largest number of rockets during Operation Pillar of Defense in 2012. The kibbutz received the second largest number of mortar shells during Operation Protective Edge in 2014 when the security situation was dire enough for even the youngest and oldest of residents to have been temporarily evacuated. The olim come from a variety of localities in Ukraine including Odessa, Kiev and Zaporizhia, The ages of the olim range from as young as eight months to 82 years old. Twenty-two percent of the olim are settling in the coastal cities of Haifa and Netanya. For more than 20 years, the International Fellowship of Christians and Jews has been helping Jews to make aliyah and has invested more than $200 million in bringing approximately 750,000 olim to Israel. The Fellowship has also been a major contributor to the Jewish Agency and helped to establish the Nefesh B’Nefesh organization. In 2014, The Fellowship began operating independently in the field of immigration. Since then, The Fellowship has brought 17,000 olim to Israel from 29 countries around the world. The olim receive comprehensive assistance from The Fellowship including special grants of $500 per adult and $300 per child. The Fellowship also sponsors their flights to Israel and ensures that they receive the absorption package that they are entitled to under Israeli law. Additionally, The Fellowship works to make sure that the immigrant families are absorbed within their respective municipalities, particularly with regards to housing and employment. Moreover, The Fellowship continues to advise the families even after their absorption process.